Both on the Dutch Wikipedia site http://nl.wikipedia.org/wiki/Scrabble#Catalaans and on the English Wikipedia site http://en.wikipedia.org/wiki/Scrabble_le...butions#Catalan we can find the Catalan Scrabble letter set. You can copy (Ctrl+C) this letter set from here and paste it directly into the table in Configuration > Game Options > Tab: Letters > Letterset. Just right click somewhere on the table and chose Paste (Ctrl+V). You can also save these settings as a preset. Insert a preset name and click on the button "Save". Catalan-language editions use these 100 tiles. I'm not sure about the LL or L·L. And how about the Q or QU ? Please tell me if words containing K, W or Y may be played when a joker is used. 8. Ciascun jolly può valere come una qualsiasi delle ventisei lettere dell’alfabeto italiano esteso, comprese J, K, W, X, Y. Nel momento in cui effettua la mossa, il giocatore che utilizza uno o entrambi i jolly ne dichiara l’identità. 10.2 El jugador que coloca un comodín debe indicar en voz alta la letra que este representa, lo que no puede modificarse durante la partida. El comodín no puede reemplazar la K ni la W, porque estas letras no existen en el SCRABBLE , versión en español. Está permitido usar los dos comodines en una misma palabra. El premio de 50 puntos otorgado por utilizar las siete fichas del atril (art. 19) se contabiliza incluso utilizando uno o los dos comodines. Now I see myself that there are no words with K, W or Y at all in your word list: 0 hits when searching in Notepad++. So the Catalan joker rule seems to be the same as in Spanish. Currently, no words with K, W and Y (alone) are allowed to play. Q followed whith something different to U, as instance QATARIA, is not allowed. So I confirm that there will be no letters K, W, Y and Q in the Catalan letter set, not even for the letter choice when you want to place a joker (blank tile). This means that no words containing K, W, Y or Q can ever be placed, not even foreign words. But we will have QU as a digraph in our Catalan letter set, besides the digraphs LL and NY. Of course the catala.dic has to be adapted for those digraphs. That means that in all words containing L·L this digraph must be replaced by the number 1. 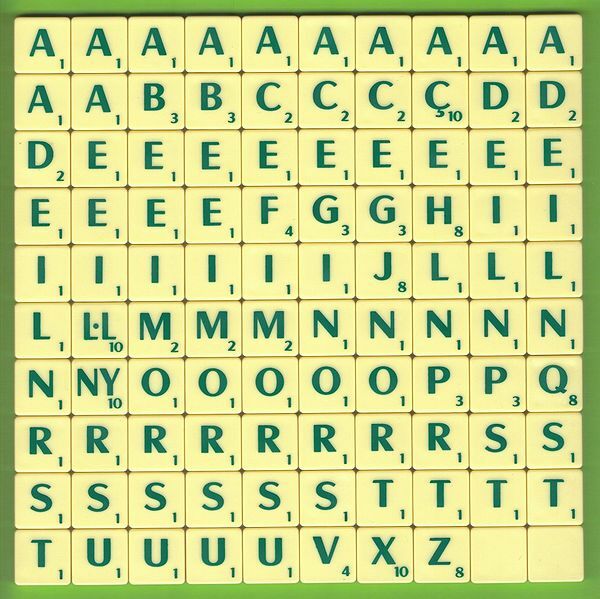 NY must be replaced by the number 2 and QU has to be replaced by the number 3, otherwise digraphs will not work in Scrabble3D. Please, add Catalan support out-the-box in next Scrabble3D stable version.